Need simple, gluten free kid’s snacks? 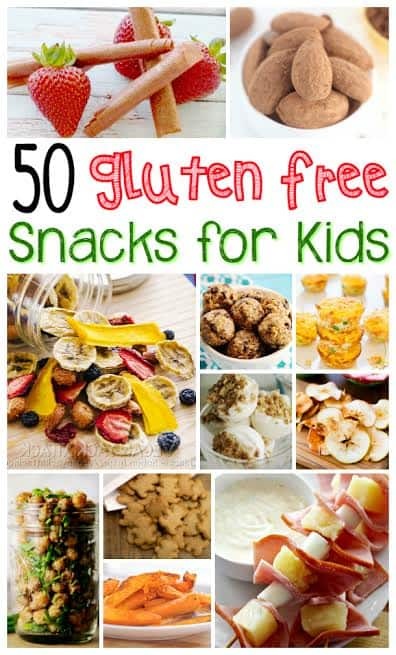 Check out these 50 gluten free snacks for kids for inspiration! Some of them make great gluten free lunches for kids too. If the thought of finding a gluten free snacks for kids gives you a headache – don’t worry! Even though it may seem like everything has gluten in it, I’ve compiled this list of 50 gluten free kid’s snacks. By putting in a few extra minutes of prep in the kitchen, you’ll be amazed at the amount of yummy snacks you can put together for your family. Who needs bread when you can enjoy ham, cheese, and pineapple kebabs? These finger friendly foods include everything from energy bites, homemade fruit filled trail mix, various veggie treats, and even a few sweets. There are many options on the list that are perfect for swapping with the gluten-free variety. Ditch crackers made with wheat flour and make cheese or quinoa crackers. French fries and tater tots sometimes contain wheat – so make your own flavorful fries out of sweet potatoes or even avocado. Don’t be surprised if making things from this list for your kiddos, makes you super hungry!